There is just one topic everyone is talking about and it's this weekend's north London derby. Arsene Wenger held his pre-match press conference yesterday lunchtime and the early team news is that Laurent Koscielny is most likely out of the game with Theo Walcott and Gervinho facing late fitness tests. Koscielny wasn't able to undergo a fitness test yesterday, so it does suggest he's in too much pain and at this late stage I doubt the manager will want to take a risk on him. So we're likely to see Alex Song continue in the heart of the Gunners defence alongside Per Mertesacker. Thomas Vermaelen won't be ready after the international break as expected and will probably return in early November from the sound of it. Sounds like he had a slight setback but nothing too much to worry about. The manager - who celebrated the 15th anniversary of his appointment as Arsenal's boss yesterday - was keen to make everyone aware that tomorrow's game was not just any game and that it was indeed very important. It's great to read that the manager's commitment and values are pretty much exactly the same as when he joined the club. He wants us to be the best and that's what we want as supporters as well. He talks about doing a further 15 years, which sounds ambitious for a man who will be 62 later this month. Wenger has had a very good record against Spurs and one which he'll hope continues tomorrow. "Those who say this derby is the most important of my 15 years might be right because it's the next one — and that's the only one that matters to me. "Maybe people expected us to crumble completely with the start that we had but they don't know us well enough." And it appears that Pat Rice has continued to press the importance of a good result in this fixture. 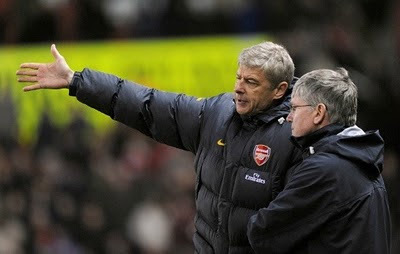 "When you see Pat Rice you realise the game is important. "I didn't know what the North London derby was like before I arrived here. I [thought I] knew, but when you experience it, it is different. "In England you have some derbies that are really passionate - Tottenham-Arsenal, Liverpool-Everton, Man United-Man City. "In terms of Pat Rice you see that people are becoming a bit more nervous when the derby comes. The players feel the importance of the games." There are a lot of players in the squad who have never experienced this game before so it's good they've got someone like Pat Rice telling them of the importance of this game. It's about local bragging rights. The ability to walk into your workplace or classroom on Monday morning knowing your team is better than the guy who sits opposite from you. To know that you have the advantage in the banter. The games against Manchester United, Chelsea and Manchester City might be important but this game against Tottenham is the one which no Gooner wants to lose. And Robert Pires believes those on the pitch tomorrow wearing red and white need to take their chances in order for us to win. In the Daily Mirror, Per Mertesacker says he's looking forward to playing in his first NLD. He also talks about his support of the club, which began when he visited England in 1995. Away from the game, the manager has reacted angrily to suggestions Robin van Persie will be sold to Manchester City in January. "Anybody who wants to sign one of our players… everybody has my phone number and can call me. "I never said I was unhappy with Man City but I don't know why we speak about transfers. I will never answer any more. Robin is under contract until 2013. This is a story created to create a story. There is no truth in it. "Why should we sell players in January? Man City already have problems because they have too many strikers, they pay half of the league for them to play away somewhere. Why should they want to buy strikers? It's very difficult to understand." Obviously the last comment was directed at the fact City are paying a large proportion of Emmanuel Adebayor's wages whilst he's on loan at Spurs. Even though he's not allowed to play against his parent club. And Wenger is right, there is no way the club would sell van Persie half way through the season. There is no logic to it. We don't need the cash - as our financial results have proved. What we do need to do is tie down the players who are in the final years of their contract - as the Arsenal Supporters Trust points out - and then add to the squad with top quality. Elsewhere there is a bit of a weird interview with the girlfriend of Wojciech Szczesny in The Sun. For some extra reading, take a look at the Daily Telegraph's interview with Josh Kroenke, Stan's son. And that's it. Tomorrow at 4pm is when all the talking stops. I'm sure the team will be as up for it as we are. I'll preview the game in even more depth then. Have yourselves a good Saturday.